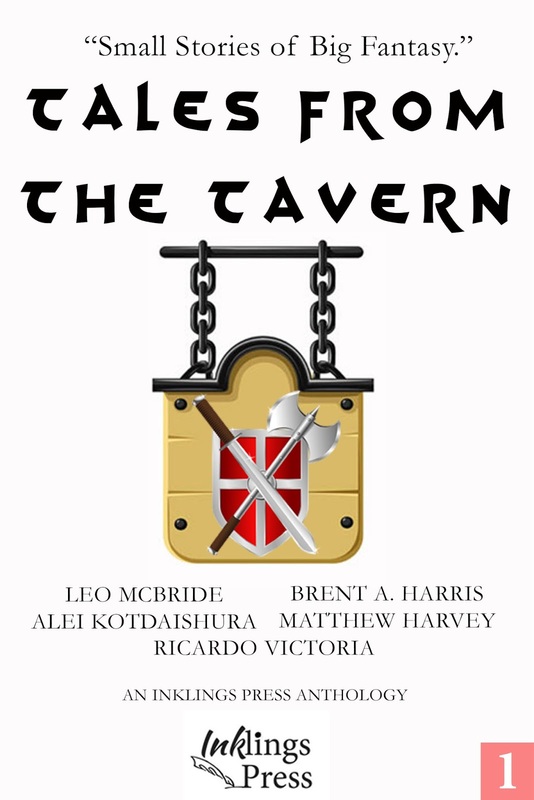 Author Leo McBride - the pen name of Altered Instinct host Stephen Hunt - has a story featured in the new fantasy anthology Tales From The Tavern, published by Inklings Press. The book is newly available on Amazon, also featuring Brent A. Harris, a California-based writer, Mexican writers Alei Kotdaishura and Ricardo Victoria, and UK-based writer Matthew Harvey. Inklings Press caught up with Leo for a Q&A about the project. Inklings Press started out as a group of fellow writers encouraging one another – how did that project help you? Honestly, when it started out, I wasn't sure where it was going. I thought it was a bit of editing advice here, a bit of writing advice there. 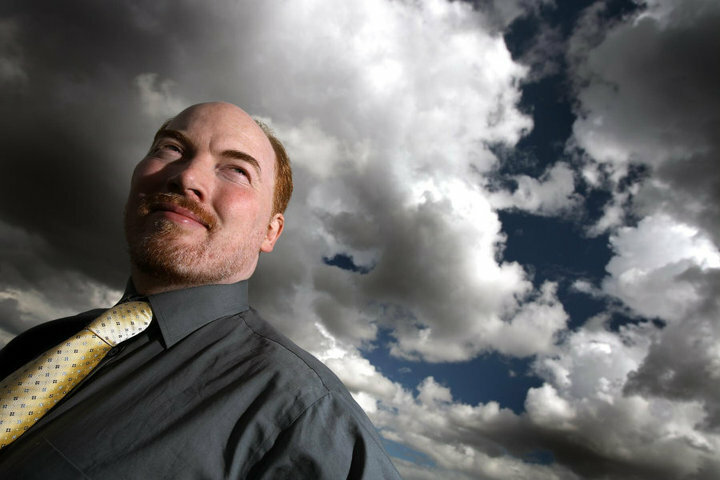 But thanks to the persistence of Ricardo Victoria initially and then Brent A. Harris, it grew from a little bit of chat between us to a real drive towards getting published. I really have to take my hat off to them, they were inspirational, and I mean that even though I'm sure they're blushing if they read this. Later, Alei Kotdaishura and Matthew Harvey came on board. There's a couple of others bubbling under too who may well join in for later work - but I won't mention them until they're ready to come forward. It's a real encouragement to see people eager for your work, though, and a little daunting when I see what they are capable of too! Your group is scattered quite widely around the world – was that a problem? How did you manage to keep one another on track? It wasn't really. Time zones were perhaps the only awkwardness - but then given my weird working hours, that probably helped. Here I was on east coast US time but finishing up at midnight at work meant it was still mid-evening for my fellow writers. Except for poor old Matthew who was snoozing away in the small hours in the UK! But no, we nudged one another along through Facebook and Twitter, each of us understood deadlines for getting particular tasks carried out by and here we are, with the first collection published, which feels kind of magical, I have to say. Does your location play into the kind of fiction you write? Are you inspired by your surroundings? If not, what has proven to be your inspiration? Yes and no. It depends on the story, really. For example, there's a horror story I'm working on at the moment that is absolutely, 100% inspired by some local myths here in The Bahamas, and another sci-fi story that draws on the island locations. But for the story published in Tales From The Tavern, that was very much inspired by an old gaming session with friends. I wanted to shake out the characters which may at some point feature in a fantasy novel I've been tinkering with, and putting them in a short story really gave a chance to feel who the characters were and how they interacted with one another - even if one of them might not be very likeable! How long have you been writing fiction, and what gave you the impetus to become a published writer? I've been writing fiction forever, since I was a little kid still learning to write letters. Over the years, that creative impulse has been redirected in different ways, but more recently, the drive to actually get more focused on the writing came through the NaNoWriMo project. For those who don't know, that's the National Novel Writing Month - every year, there's a challenge to complete a novel in a month. Now, I've never been close to completing the whole thing, but taking part really helped me shape my writing again and just to get on with doing it. The local co-ordinator here, Alicia Wallace, is full of drive and energy which is so infectious. From that, I am very well on with Fresh Blood, the novel I set about creating that first year in NaNoWriMo and which I hope to wrap up this year for publication. There's nothing quite like people asking "How much more have you done?" for nudging you along the right path. What do you most enjoy about your own work? Now that's a tough one. I agonise over my own work, so it's not easy. But what I do enjoy is being able to express myself and my ideas and hopefully tantalise readers and make them want more. What are you most trying to convey in your story? In A Taste For Battle, from my perspective, it was all about two things, establishing character and starting some world building. These characters are likely to return at some point and so I wanted to see how they interacted, see them as friends of sorts, even if they make bad decisions and might not entirely be honest all the time. From the other stories in the publication, which one most attracted you, and why? It was a pleasure reading them all, of course, but the one that stuck with me most from the book was True Story, by Alei Kotdaishura. It played around with expectations, had a lovely, warm humour to it, and left me with no idea how it was going to finish up. A lovely concoction of a story. It was the first story I've read by Alei, so I'm looking forward to reading more. This is the first publication for Inklings Press. What future plans are there? Earlier on, I mentioned working on a horror story at the moment, which I'm hoping might feature in the next collection by Inklings Press, which will be a horror anthology aimed for around Hallowe'en. The idea over at Inklings is to try to serve as a platform for new writers and new work, so I'm looking forward to seeing how it develops as it grows. It's a pleasure to open up a book with no idea of what to expect from the writers and where the stories will go. As future plans go, that's one I very much want to see turn to reality. 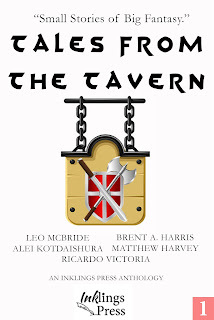 Tales From The Tavern, featuring stories by Leo McBride, Brent A. Harris, Alei Kotdaishura, Matthew Harvey and Ricardo Victoria, is available on Amazon here. Tomorrow, fellow author Ricardo Victoria will join us for a Q&A on the blog. Awesome job gov! Looking forward to a read. If i had known would have taken it to the Lakes this week. Thanks - let me know what you think afterwards, be good to hear!